So, your other half has popped the question and you’ve excitedly said yes! After the obligatory texts and phone calls to share your good news, you may begin to start thinking about what kind of wedding venue you’d like. 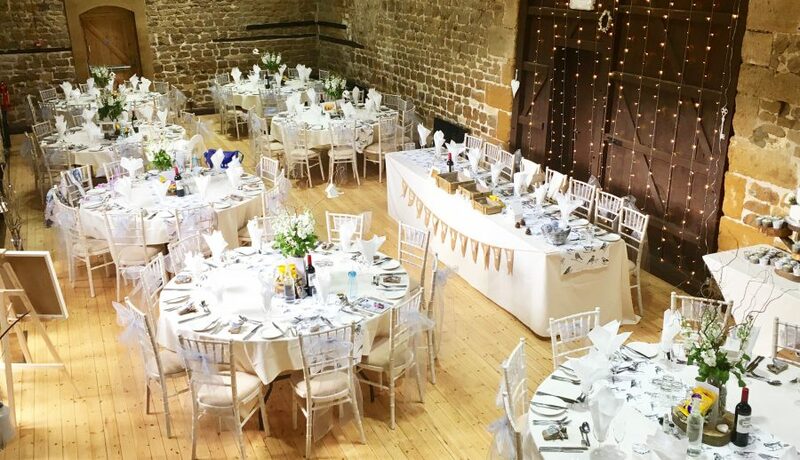 If your dream wedding venue is one set in stunning English countryside in a sympathetically restored Grade II listed barn packed full of original features and rustic charm, you should definitely be looking at The Barns at Hunsbury Hill. We provide dedicated support for planning your wedding from start to finish taking much of the stress away and are fully licensed for civil ceremonies. This means your entire wedding can be held with us and you and your guests will not have to travel from wedding venue to reception venue. Here at The Barns we also offer exclusive use of the venue and grounds, not like some venues where you may bump into other peoples’ guests on the way to the loo! Our courtyard and gardens offer beautiful locations that your photographer will love you for, as well as pretty little spots located around the grounds for those intimate Bride and Groom shots. For the wedding ceremony itself, our restored barn with exposed stonework and wooden beams makes a truly stunning backdrop, enhanced by your own choice of colours and décor. There is room for up to 85 guests for the wedding ceremony and up to 180 guests for the evening. We have a fantastic catering partner in Impressions Catering who work as part of your wedding team and with you to provide a stunning menu for your special day. The Barns is truly a hidden gem of a venue, yet is located 10 minutes from the M1 making it easy and convenient for your guests to get to with plenty of free parking.